TravelSkite: Art v. nature? Art + nature! Art, eh? Never lets you down. Either it's glorious, or awful, or so meh that you can hardly believe anyone spent time on it, let alone would consider handing over hard-earned for it. 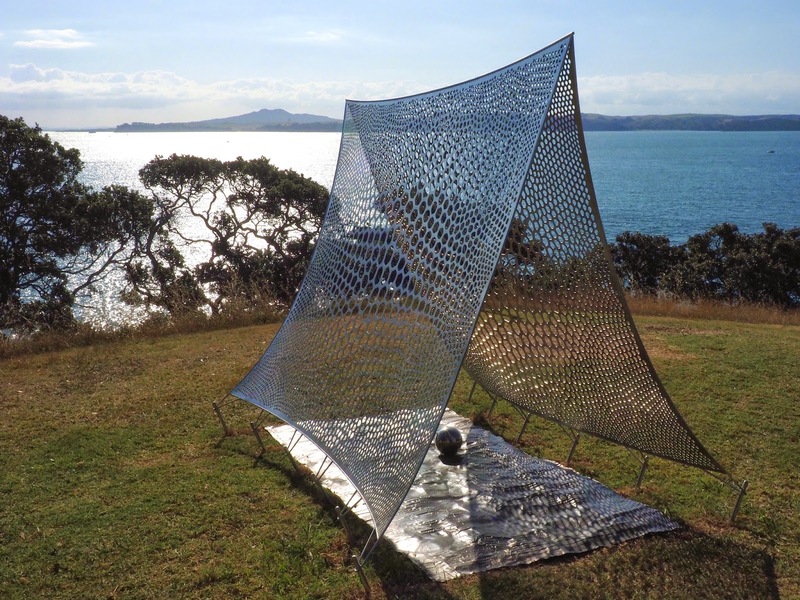 So, one way or another, you always get a return on your time going to look at it - and Waiheke's biennial headland Sculpture on the Gulf would be a rewarding hour spent even without the art. It's on now, and on a golden summer evening when the fussy crowds that irritated me last time had disappeared, I thoroughly enjoyed my walk along the two-kilometre trail that ends (or begins) at Matiatia near the ferry wharf. This year there are 31 artworks along the route, and I think it was good going to find five or six that I really admired. It's art, it's personal, the people behind it come at life differently, you can't expect to aim much higher, I think. There was a satisfying number of pieces that had me going Pft! and gasping in real astonishment at the price being asked: a tree hut, for example, a real tree hut of assorted scrap timber, not big, not high, in no way exceptional - $20,000. There were plastic bird-like things in the trees made from coloured cable ties, there was an app to download from a QR code, that I couldn't get to work, there were telegraph cables strung a metre off the ground with a recording of wailing, there was a messy thing made of disparate bits that you were meant to hit with padded sticks. Art. But there were also some gorgeous tall, silver dandelion clocks, a delicate-looking silver tent, an elaborately carved wooden spinning top, a metal pohutukawa flower dome that wasn't so special from the outside (though lots of work went into it - a more well-deserved $30,000) but from inside strikingly framed the harbour scenery. And that, for me, is really the best bit about Waiheke's sculpture trail: that the art is designed for its setting, so that when it works it enhances what is already a strikingly beautiful scene - and, with a camera, lets people like me make art of our own. The sculptures will be there until 15 February - and it's another two years until the next one. Go and see what you think.